Almost every sport has some sort of unique footwear. In ICE SOCCER, footwear with a well–defined, substantial toe–box is mandatory to prevent toe injuries when kicking the Boot'r. 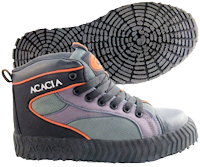 Regular winter footwear with treaded, lugged or ribbed soles (or hiking boots) can be worn for play on "dirty ice". Not allowed are ice skates (ruin the Boot'r/not intended in the sport's design), "sneakers" (injury to toes) and footwear with cleats or spikes (injury to knees and ankles when turning). Special shoe–boots (broomball shoes), designed for hi–traction on ice, are ideal for play either on new or "clean ice" or on "dirty ice" (if allowed by local league rules) because they provide greater stability, maneuverability and speed. This footwear is available from Taylor Sports, LLC. Protective gear is also standard for most team sports. The mandatory protective gear for organized competitive ICE SOCCER play includes a helmet (such as a hockey helmet) designed to provide maximum side and back-of-head protection, and hard-cased elbow pads. The goalie requires additional gear: a face–mask on the helmet. Additional optional equipment may be worn by players; knee pads, a hip girdle with tail-bone protection (similar to inline skating equipment or hockey pads with such protection), a face guard on the helmet, shin guards, wrist guards, and for the goalie, a chest protector (like that worn by a baseball catcher), shin guards, heavy duty knee pads and gloves.